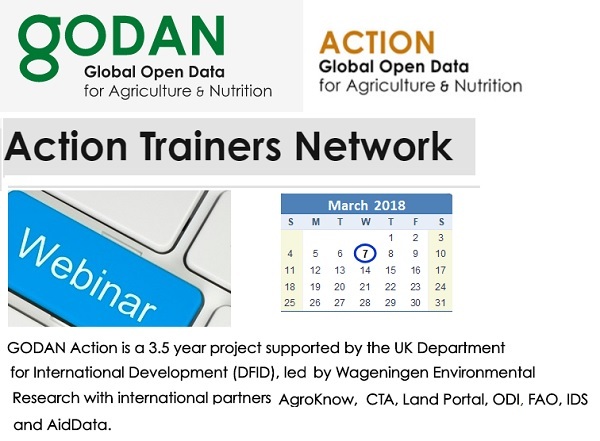 GODAN is a member of the Group on Earth Observations (GEO) and is pleased to have this webinar from GEOGLAM to learn more and expand synergies and collaborations for the future. With the growing availability of satellite data and advances in high performance computing, there are new opportunities for agricultural monitoring, for example providing up-to-date information on cropland extent, crop condition and improved crop production forecasts. The Initiative GEO Global Agricultural Monitoring (GEOGLAM) - launched in 2011 - is strengthening agricultural monitoring systems at the global and national level by coordinating activities to develop robust methods, to ensure the continuous provision of Earth observations data, and to provide policy relevant information on agricultural production to support markets and food security early warning. In this webinar, Ian Jarvis (GEOGLAM Director) and Alyssa Whitcraft (GEOGLAM Program Scientist) will provide a high level overview of GEOGLAM, then focus on the monthly crop condition consensus reports – The Crop Monitors, their capacity development efforts from a regional perspective. They will share examples of how GEOGLAM is making a difference to global food security with earth observation data and how they see their future directions for the next 5 years.